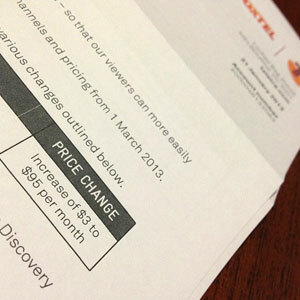 Ironically, just days after cancelling Foxtel, we got a letter explaining how recent improvements to the service meant our monthly fee would have risen to $95 per month. A big thank you to the programmers at Foxtel for making it such an easy family decision to cancel our pay TV contract recently. Not only are we now saving money, I’m finding more time to be productive AND enjoy other forms of recreation, like reading. Here’s what happened. We had been paying almost $100 a month to Foxtel for a few years, for the pleasure of seeing the Free-To-Air channels (we live in a TV shadow), some sport, some kids shows, and a few programs not yet on Free-To-Air. However, over the past six months, we really noticed the quality of Foxtel programming plummet with a flood of repeats and junk reality TV. Coupled with that, our appetite for watching sport for sports sake declined to nil. As we watched money pour out too easily each month (it was coupled with our Telstra bill), questions began to arise about what else we could be doing with that cash. The final straw was my dad bringing over a digital receiver. Lo and behold, the days of the TV shadow wasteland were over, we could get everything except Channel Seven 2. It took just one morning of decision to visit JB Hifi, pick up a Personal Video Recorder (PVR) and a unit for that recorder to tap into our home wifi, and we were set. Me: Tech peeps: Any recommendations or warnings about digital video recorders? Is @jbhifi as good a place as any? 1TB, twin tuner – sounds good? Friend Two: Make sure you can do the settings automatically but with the ability to change them later. We had one where the settings were hard-wired in the memory- once you set them, you could never wipe them out and start again! You guessed it- we wanted to reset as they were fuzzy the first time… There are perfectly good ones under $100. JB Hifi will have expensive ones, no worries! Friend Three: We’ve had an LG pvr for a few years, bought it fom Harveys about 4 years ago I think. It does the job, but has some dodgy moments. Best advice I can give is to find the models being offered by the stores and Google or check on Whirlpool for discussion forums and reviews. It may seem like a bit of running around, but you’ll be using it for several years so eliminating flaky units by spending a few extra $$$ is well worth it. Friend Five: We have always been impressed with the staff Jbhifi Gepps Cross. We have a Panasonic and even I can drive it. After fiddling with wires, we had signal and tested the new Panasonic recorder’s ability to schedule and record from all the free digital channels. One thing that the Panasonic doesn’t do as well as the Foxtel IQ2 unit, is record series (it does it, but overwrites the old episode plus it only works on time and day of week and does not actually respond to the TV schedule) and if both channels are recording, you can only choose to watch live TV from one of those channels or a recorded program, you cannot watch a third unless you switch back to the TV directly. My advice is that if you are wondering about whether to leave Foxtel or not, reflect on what programs you actually watch and/or record. If they turn out to be almost exclusively free-to-air, it just seems silly to be paying monthly fees ON TOP of paying by being exposed to the commercials. I’ve known for ages that having TV on tap is not good because it can eek in to gaps in your life and just sap time, time you will NEVER get back. If you’re going to make it to the top, then you need to spend at least one hour each workday focused on reading and learning more about WordPress — outside of any development work. There are no shortcuts, and no other ways around it. Learning and mastering WordPress is going to take time. If you watch TV, cut it out — more than 90% of it isn’t good for you anyway. If you’re a gamer, sell your games or throw them away. Reaching the top takes commitment and sacrifice and the best place to start is with the things in life that aren’t doing you any good anyway. This is such good, wake-up-call advice. Our lives are short and finite. Every minute spent ‘wasted’ in front of that tube watching sub-par crap that is not truly entertaining or informing us, is such a waste of this precious thing called life. Sadly, the Free-To-Air television body, FreeTV, has revealed Australians watched an average of three hours and six minutes of TV per person per day in 2012 in metro areas, three hours and 21 minutes in regional areas. That is a LOT of wasted time. Per person, this means many of us are wasting 6.5 weeks of every year in front of the TV. That’s right, 6.5 weeks of 24-hour viewing every year. That is scary. Perhaps this is why FreeTV figures also show that one in three of us use social media while watching TV – at least this way we get to communicate with some other sentient beings. But habits die hard and for many of us it is hard to feel like the day is done without our ‘deserved’ dose of a little time in front of the tele. The truth is, once you can pull back the curtain, Wizard of Oz style, and see what is really happening, it becomes a little easier to break free. Here are my final thoughts on the topic. Much thanks must go to Foxtel and the free-to-air networks for dumbing down their content and making it generally forgettable and glaringly formulaic. This is making it increasingly easy for many of us to break the TV habit. Choose programs to record in advance. I find that by using Your TV Guide on my iPad in advance to choose which shows to record, my brain is much more critical and often decides to record nothing. The few kids shows our kids miss from Nick Junior can be bought on DVD. One extra month’s worth of Foxtel fees covered them. Search for industry topics and personal interests on YouTube, along with favourite speakers, writers and actors. You will find a lifetime’s worth of interesting content there among the silly cat videos. Join meetup.com and search for your interests. You’re bound to find some groups meeting in your area that you can join – such a better use of an evening or two a month than TV. Read and write. Books are great but maybe getting your thoughts and reflections down on a blog might be just the thing you need to buy some ‘thinking time’. Who cares if nobody reads them. The truth is, some people will. Google has a great knack for connecting people to all sorts of particular and niche topics, so go ahead and write about How porcelain ducks on your grandparents’ wall helped me solve an algebra problem. Even I’d be curious to read that one! You can start blogging for free at wordpress.com. Finally, yes, there are some evenings when exhaustion means plonking down in front of the box. But I am trying not to do that immediately before bed, thanks to this article on The art of sleeping well by Nathan at iNform Health.